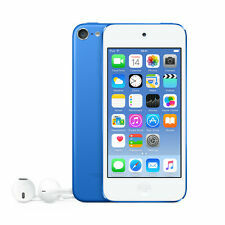 Enjoy your favourite music on-the-go with the blue iPod Touch from Apple. 32GB storage – holds the equivalent of 8,000 songs. Battery – up to 40 hours of music playback. Apple iPod Nano 1st Generation Black (4GB). Top right hand corner looks like it has been squashed very slightly, and there is a thin scratch to the left of it, please see last photo. Back has scratches which; I have taken a photo with the light hitting it at an angle so that they are emphasised. Instruction booklet is included. Apple iPod Touch (4th Gen) A1367 - 32GB - Black. In excellent condition, there are no marks on the screen, no marks on the white front. The front is in excellent condition. Bought new from John Lewis, one owner from new. There is a white USB CABLE(which i found after i took the Photos.). For sale is fully boxed ipod classic newest 7th generation with massive 160gb capacity in dark grey. ipod will be supplied fully boxed with cable for music transfer and charging purposes. technically ipod works like new as well. Apple iPod Shuffle 2nd Generation Blue (1GB). Th Generation RRP £129 VGC TurquoiseBlue. This wasoriginally a present and has not been used. It is equipped with Bluetooth so can be linked upto your car or wirelessheadphones. Apple iPod Nano 16 GB 7. Apple iPod shuffle 4th Generation (Late 2012) Blue (2GB). Condition is Used. Dispatched with Royal Mail 2nd Class. Used iPod Touch 3rd generation but still in good working order. The ipod, In-Ear wired headphones, leather case (used) and Apple charging cable. Apple iPod shuffle 2nd Generation (Early 2007) Pink (1GB). Hardly used, very good condition. Fully working & good condition for age. Apple iPod Nano 3rd Generation Light Green (8GB). In excellent working order and condition. Front is perfect, some surface scratches on chrome back (please see photos). Comes with original Apple earphones which are unused as I used iPod with speaker dock. Original Apple charger, original Apple box and leaflets. It even has the original 2 white apple stickers which are unused. In addition there is a silicone lariat style case. Genuine bargain. You are viewing a Apple iPod Nano 7th Generation 16GB Space Grey (A1446) which is fully functional. It is used and has quite a number scratches on around the middle and bottom of the screen. There's some marks on the edge and back. It comes with a case. No other accessories or charger come with it. Apple iPod Classic 30gb in White. iPod only, no cables. Working, but covered in light scratches. Apple iPod Touch 4 Inch 6th Generation 128GB - Gold. New And Sealed as pictured. Not refurbished. Unregistered with Apple so still under full guarantee. 100% positive feedback Will be posted within two working days of payment by signed for service. Not available for collection. For sale is an apple ipod 160GB 7th generation MP3 Player for sale. The ipod so has general wear. Apple iPod Nano 4th Generation Blue (8GB). Supports AAC, Protected AAC, MP3, MP3 VBR, Audible, Apple Lossless, AIFF, and WAV audio formats. 8 GB Storage Capacity (Estimated Free Space 7.2 GB) for 2,000 songs, 7,000 photos, or 8 hours of video. Screen has screen protector on. Apple iPod Touch 6th Generation 32gb - RED Special Edition - A1574 Model Number. Limited edition model. Very good used condition. No major scratches on screen or back, only really has the odd mark on it. It is used so don't want to say perfect but it is in great condition. Comes with a Smiggle rubber case. Only thing that let's it down is the battery life. It isn't appalling bad but certainly isn't great. Just being honest. Comes as it is with box and the rubber case. No charger, no headphones. Has been reset to factory settings. Payment by PayPal. Will only ship in UK. No overseas bidders. Enhanced noise reduction and face detection makes for cleaner, more compelling portraits and scenic shots. Surf the web using Safari. Here’s what Apple has to say about it. Apple iPod Classic 5th Generation Black (30GB) - Great Condition! Battery Issue! FOR SALE: iPod Classic 5th Generation 30GB. We have for sale an amazing iPod Classic 5th Generation 30GB. The iPod is in great condition for it's age, the front is in great condition with only light surface blemishes from usage over the years. 4.5 out of 5 stars - Apple iPod Classic 5th Generation Black (30GB) - Great Condition! Battery Issue! 261 product ratings261 product ratings - Apple iPod Classic 5th Generation Black (30GB) - Great Condition! Battery Issue! Ipod Classic 5th Generation 30gb. Condition is Used. Dispatched with eBay delivery – Shutl 2-3 days. Been sat in a drawer for a few years. Tested and seems to work ok. Have restored to original settings through iTunes and comes with usb charging / syncing cable. Obviously there are a few surface scratches but these are mainly on the side and back and the screen is good. Happy Bidding! Apple iPod Classic 7th Generation Black (160GB) - MC297QB/A. Is in working condition and can see that it is working in the pictures. Box and ipod needs a clean and some age related Mark's but no major dents or scratches. Condition is Used. Dispatched with Royal Mail 1st Class. New front and back housing. new battery. Apple Ipod Touch 5th generation. Ipod only with original box. Apple iPod Classic 1st Generation U2 Special Edition Black/Red (20GB). Condition is Used and some scratches and works fine. Dispatched with Royal Mail 1st Class. Apple iPod Nano 6th Generation 8GB - Silver. Fantastic Condition, Like New. Condition is Used, But Hardly Used. Only Sign of Wear is a Tiny Dint to the Bottom (can be seen in photos) Dispatched with Royal Mail 1st Class. Open to offers. Check out my other items. Please note: sale is for iPod only, no charger or headphones included. Apple iPod nano 7th Generation Grey (16GB) - Space Grey. Condition is Used. Comes with USB cable and does not include packaging. Dispatched with Royal Mail 1st Class. Apple iPod Nano. 16GB Silver. Apple iPod classic 4th Gen 20gb Great Condition NO RESERVE (1). This item is in great condition but does have plenty of hairline marks and scuffs, as appropriate to age. Works perfectly. Dispatched with Royal Mail 1st Class. Apple iPod Nano. WHAT IS A PAT AND HAS THIS ITEM BEEN PAT TESTED?. If the item has failed it’s PAT test, the item will be listed as spares and repairs and failure reasons will be noted. 16GB Storage. Apple iPod touch 6th Generation Space Grey (16GB). Being sent with original headphones and box. Screen in great condition with a couple of minor light marks, back in great condition with a couple if small marks. Working well, Great used condition and looked after well. Please check out my other items as I am having a huge clear out. Pink Apple iPod Shuffle (2nd Generation) 1GB.